The Sony PXW-Z90 – a compact 4K camcorder with auto focus at it’s best! Normally when I travel up to arctic Norway for my annual Northern Lights expeditions I take a large sensor video camera. Last year it was the Sony FS5, which performed very well and gave me some great results. But this year I decided to down size and instead of taking a bulky camera I chose to take a pre-production sample of Sony’s diminutive new PXW-Z90 camcorder. In Norway with the PXW-Z90. On the outside the Z90 looks almost exactly the same as the older PXW-X70 camcorder. I’ve shot several videos with the X70 and it’s a great little camcorder that produces a very good image considering it’s small size. Being a new model I expected the Z90 to offer some small improvements over the X70, but what I didn’t expect was the very big improvements that the Z90 brings. The Z90 is the first camcorder from Sony to incorporate a new design of sensor. It’s a 1″ type sensor, so like the X70, bigger than you used to find on small handycams, but not as big as the super 35mm sensor found in the FS5, FS7 etc. This is a nice size for this type of camera as it makes it possible to obtain a shallow depth of field by using the cameras built in ND filters (yes- it really does have ND filters built in) and a large aperture. Or if you need a deeper depth of field for easier focussing or run and gun then you can use a smaller aperture by switching out the ND filters. The maximum aperture of the zoom lens is f2.8 but it does stop down to f4 towards the telephoto end. This new sensor uses a new construction method that allows it to have several layers of electronics immediately below the imager pixels. The “stacked” sensor can as a result incorporate more image processing and a large memory area right under the pixels. This means that the sensor can be read out much more quickly than is normal for this type of camera and as a result rolling shutter is hugely reduced (I didn’t notice any in any of my footage). As well as a reduction in rolling shutter compared to other similar sensors, the ability to do more on chip image processing appears to bring other advantages as the noise levels from this camera are very low indeed. Frame grab from a night time snow scooter ride. Shot at +15dB gain the noise is still very minor. (click on the image to view a larger version. The low noise levels mean that this camera performs surprisingly well in low light. Adding in +6dB was not a problem if needed. Even with +15dB of gin the images hold together very well. Clearly the camera is doing a fair bit of electronic noise reduction at higher gain levels and there is a slight increase in image smear as a result. Plus in certain circumstances the noise levels do rise, especially if you have large dark areas amongst in an otherwise brighter scene. 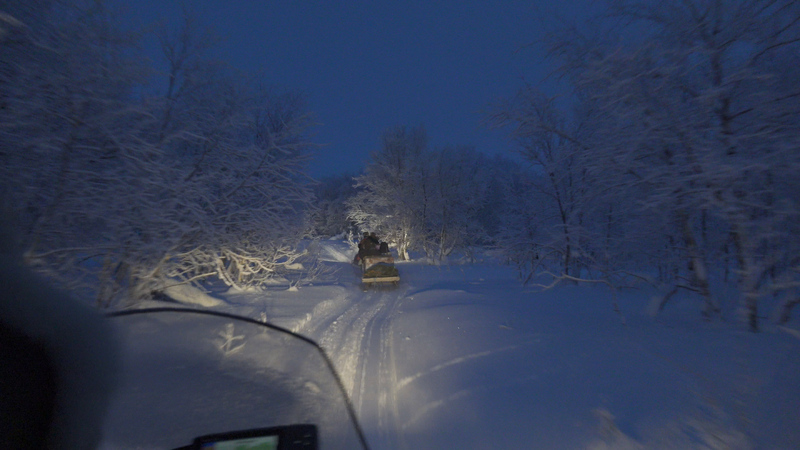 In my sample footage during the night time snow scooter ride, which was shot at +15dB gain, you don’t see and noise over the snow, but you can see some grainy noise over the dark jacket of the snow scooter driver (see the frame grab above). The fact that you can push the camera up to +15dB and in most cases get a pretty good image is very nice. Frame grab form a PXW-Z90 – Hybrid Log Gamma. Click on the image to see a larger version. On top of good sensitivity you also have great dynamic range, more than the X70 and enough to make direct HDR shooting and log shooting possible with this tiny hand held camcorder. It doesn’t quite have the dynamic range of an FS5 or FS7, but there is still plenty of range to help deal with challenging lighting situations. As well as bringing a nice improvement in image quality over the X70 (which is pretty good already) the new sensor brings a vastly improved autofocus system. There are 273 focus detection points which are combined with faster readout, faster on sensor processing and the same AF processing technology as used in the flagship Sony A9 stills camera. This brings a really remarkable autofocus system to this camera. The AF system is a newly developed hybrid system that combines phase detection AF with new algorithms created specifically for video rather than stills photography. At last this is an autofocus system that really works for a video camera. It is intelligent and responsive. There is no hunting for focus, it just seems to get on with the job. Adjusting the AF response on the PXW-Z90. Just about every aspect of the autofocus system can be customised in the camera menu. You can choose between using focus zones, the full image width or selectable focus spot areas. The cameras LCD screen is a touch screen so you tap the screen where you want to focus. You can also tailor the AF’s response speed, you can adjust the size of the tracking range, using a wide range for occasions when you want the AF to follow an object through the shot, or use a narrow range to restrict the focus depth range. The PXW-Z90’s variable AF drive speed. You can customise how quickly the AF will move from one object to another, from staying locked on to a faster more responsive setting. In addition it has that wonderful Sony face detection system that allows you to choose one face out of a crowd of people using the thumb stick on the hand grip or the touch screen. Once selected the camera will stay locked to that face. Working with the PXW-X90 in Norway. 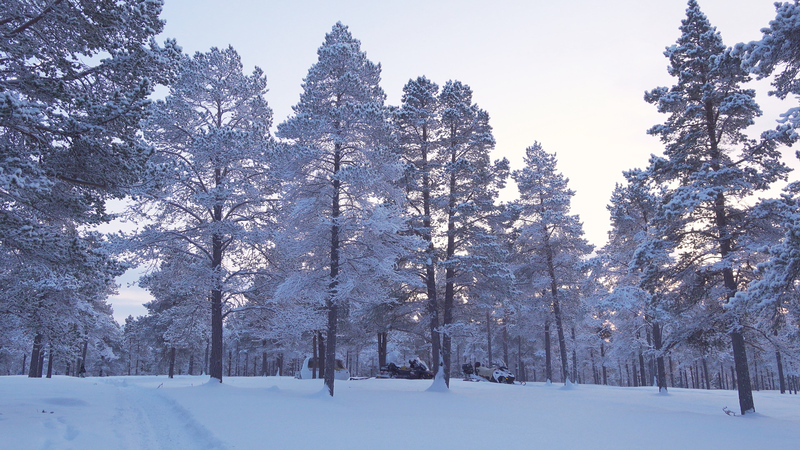 While I was up in Norway it was between -24c and -30c. In those temperatures you really don’t want to take your mittens off for more than a minute or so. Being able to rely on the cameras autofocus allowed me to keep my fingers warm. Not one shot out of all my rushes from the trip has incorrect focus. That is truly remarkable and made shooting with this camera a real pleasure. I’m not saying that you should always use autofocus. When possible I love to be able to pick and choose how I focus. But in many situations or for less experienced shooters this autofocus system will be a game changer. For my test shoot in Norway I mostly used Picture Profile number 10 which gives an instant HDR workflow thanks to the use of Hybrid Log Gamma. Using HLG you can shoot as you would do with any other conventional camera. Then take the footage and play it back in HDR on an HDR TV without any grading or other post production work. I also shot at a couple of locations using S-Log2 to test how that worked (I was shooting in UHD and the camera is 8 bit in UHD. For 8 bit I prefer S-Log2 over S-Log3). The Z90 has 10 picture profiles that allow you to tailor how the image looks, including a crunchy DSLR type look. Some filmic looks using Sony’s cinegammas as well as profiles for shooting S-Log2, S-Log3 and Hybrid Log Gamma (HLG). 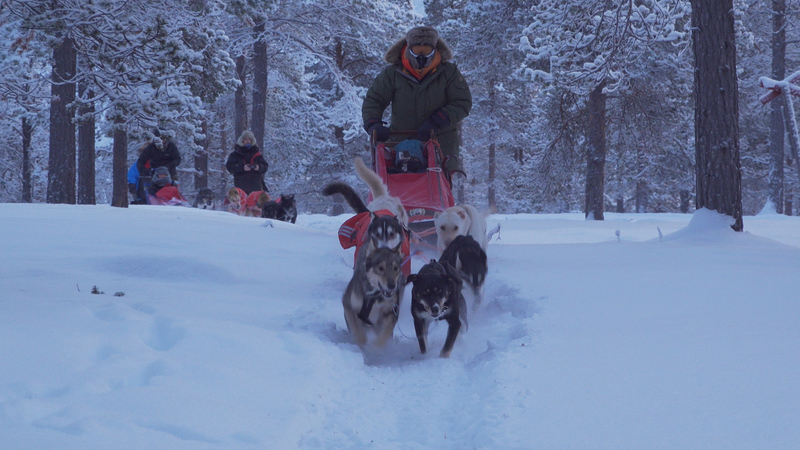 Dog sledding in the arctic (frame grab). Shot in HDR using HLG on the PXW-Z90. The Z90 has Sony’s XAVC-L codec. This high quality codec offers 10 bit 4:2:2 broadcast quality recordings in HD and 8 bit 4:2:0 recordings in UHD (3840 x 2160). The camera records to SDXC cards, so media costs are very low. There are two card slots and you can record to each slot singly, record to one card after the other or dual record on to both cards at the same time for redundancy and an instant back. You can even use each of the cameras two record buttons to control the records on each card independently should you wish. The PXW-X90 is very small, so carrying it around on the snow scooters was easy. The rear of the hand grip of the PXW-Z90. The Z90 is a small camcorder and like all small camcorders this doesn’t leave much room for large buttons and switches. The menu system and many of the cameras functions can be controlled via the touch screen LCD or the small joystick/thumb stick on the hand grip. Iris, shutter speed and gain each have a dedicated access button that selects the function. The Full Auto switch and ND filter control on the PXW-Z90. Then you use the thumb stick to select the value you want, or you can set each item to Auto. In addition there is a switch to put the camera into full auto on the rear of the camera. Just below the full auto switch is the control switch for the ND filters. The lens is a Zeiss 12x optical zoom with built in optical image stabilisation. It is controlled by a single ring around the barrel of the lens which can be switched between focus control or zoom control. In addition there is the usual zoom rocker on the handgrip as well as a small zoom switch on the top handle. In addition to the optical stabilisation the camera also has Sony’s electronic “super steadyshot” stabilisation that can be used in addition to the optical stabilisation. Another very handy function is “Clear Image Zoom”. This is a form of electronic zoom function that makes use of a database of textures and object types. When using clear image zoom the camera uses this database to apply just the right amount of image processing during the electronic zoom process. In most cases you can’t see any degradation of the image when using clear image zoom. I left it on for all of the Norway shoot as it turns the 12x zoom into a very handy 18x zoom. The wide end of the PXW-X90’s zoom range. The long end of the PXW-X90’s zoom lens. After doing so much shooting on large sensor cameras with restricted zoom ranges getting back to a small camera with a big zoom range was fun. For future Norway trips I am very tempted to switch to a camera like the Z90. The right side of the PXW-Z90. The Z90 body is almost exactly the same as the X70. The cameras top handle has 2x XLR connectors with the audio controls for the two channels on the opposite side of the handle. The audio controls of the PXW-Z90. If you want to make the camera more compact the handle can be removed, but when you do this you will no longer have any XLR connectors. Instead you will have an MI shoe on the top of the camera body that can be used to connect a Sony UWP-D radio mic or a n XLR adapter. There is also a stereo microphone built into the main body of the camera, so even with the hand grip removed there are plenty of audio options. The PXW-Z90’s flip out LCD screen. The flip out LCD panel acts as the cameras main viewfinder. Opening and closing the LCD screen turns the camera on and off. It starts up and shuts down very quickly. The resolution of the LCD is similar to most other modern camera LCD’s. It’s adequate for this type of camera, but it isn’t the highest resolution screen in the world. To check focus you have a button on the top of the hand grip to activate the image magnification function and the camera has a coloured peaking system to help pick out what is, and what is not in focus. I suspect that with this particular camera, many users will take advantage of the cameras excellent auto focus system and there is a lot of feedback to the user of how this is working including coloured boxes that indicate exactly what the camera is focussing on. The rear of the Sony PXW-Z90. As well as the side LCD panel there is also a small OLED electronic viewfinder on the rear of the camera. This is very useful for use in very bright sunlight, but it is rather small. The cameras gain, shutter and iris functions each have a dedicated button on the side of the camera. One push of the appropriate button enables that function to be controlled by a small dial wheel just under the front of the lens. Iris, gain and shutter speed controls on the side of the PXW-Z90. Press the shutter button and the wheel controls the shutter. Press the gain button and the wheel controls the gain. Overall this system works well, but I would still prefer a separate gain switch and a shutter speed up/down switch. On the rear of the hand grip there is a small joystick that sits under your thumb. You can use this thumb-stick to set many of the cameras settings and to navigate through the cameras menu system. In addition you can use the LCD touchscreen to navigate through the menu as well as select your autofocus points etc. The PXW-Z90 is a small camera that packs a very big punch. It’s never going to give the fine degree of image control that you get with most large sensor cameras and it won’t quite deliver the same image quality either (although it’s really, really close). If you need a small, discrete camera, perhaps you travel a lot, or you just need a “B” camera, then the Z90 offers a possible solution. I haven’t even touched on all the streaming, ftp and wifi capabilities of this camera. The auto focus system is a delight to use and it’s the best AF system I’ve ever come across on a video camera. The new sensor in the Z90 is clearly a fairly large step forwards from the sensor in the previous similar model the X70, it has more dynamic range, a lot less rolling shutter (not that it’s a big problem on the X70) and the final images look better as a result. I might just have to add one to my camera collection. If you would like to join me on one of my adventures to arctic Norway please see take a look at this page. I’ve been running these trips for 11 years and EVERY tour has seen the Northern Lights. 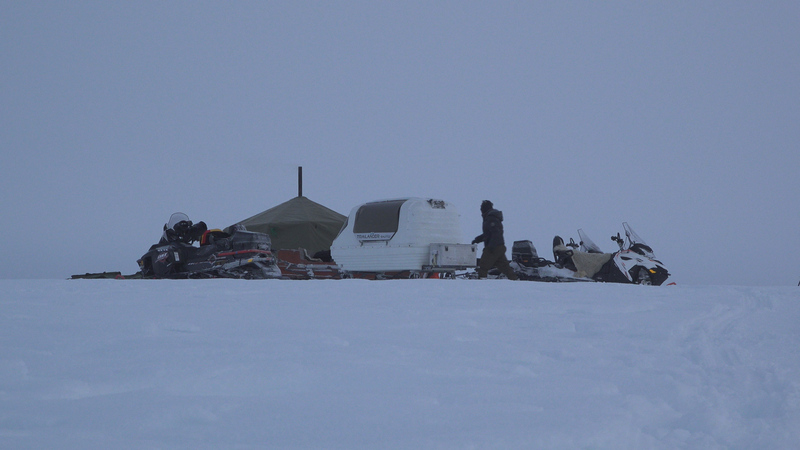 This year was no exception and we got to see some really great Auroras and had a great time dog sledding, ice fishing and exploring the Finnmarksvidda. 2018 was yet another great year for my Aurora tours. This picture taken on January 20th. FS5 Eclipse and 3D Northern Lights by Jean Mouette and Thierry Legault. 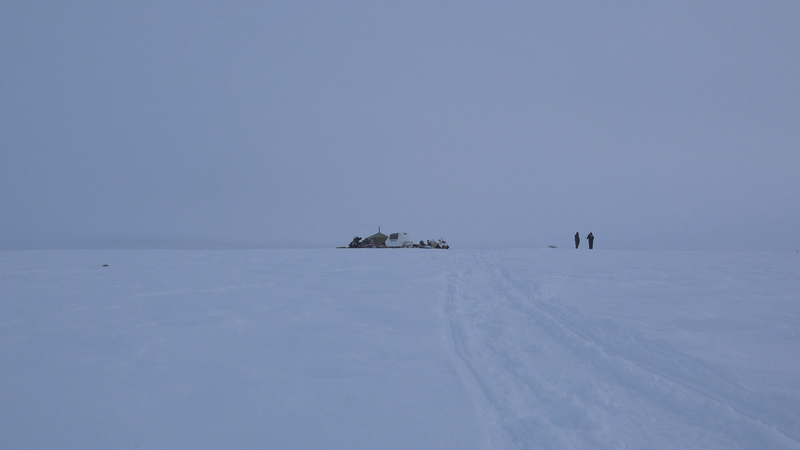 I few years ago I was privileged to have Jean Mouettee and Thierry Legault join me on one of my Northern Lights tours. They were along to shoot the Aurora on an FS100 (it might have been an FS700) in real time. Sadly we didn’t have the best of Auroras on that particular trip. Theirry is famous for his amazing images of the Sun with the International Space Station passing in front of it. Amazing image by Thierry Legault of the ISS passing in front of the Sun. To be able to “see” the Aurora in 3D they needed to place the camera rigs over 6km apart. I did try to take some 3D time-lapse of the Aurora a few years back with cameras 3Km apart, but that was timelapse and I was thwarted by low cloud. Jean and Thierry have gone one better and filmed the Aurora not only in 3D but also in real time. That’s no mean feat! One of the two A7s camera rigs used for the real time 3D Aurora project. The next stage will use 4 cameras in each rig for whole sky coverage. I’d love to see these projected in a planetarium or other dome venue in 3D. It would be quite an experience. Jean was also in the US for the total Eclipse in August. He shot the eclipse using an FS5 recording 12 bit raw on a Atomos Shogun. He’s put together a short film of his experience and it really captures the excitement of the event as well as some really spectacular images of the moon moving across the face of the sun. I really shows what a versatile camera the FS5 is. The Dangers Of Hidden Moisture. Electronics and water are two things that just don’t match. We all know this and we all know that dropping a camera into a river or the sea probably isn’t going to do it a great deal of good. But one of the very real risks with any piece of electronics is hidden moisture, moisture you can’t see. Most modern high definition or 4K pro video cameras have fans and cooling systems designed to keep them operating for long periods. But these cooling systems mean that the camera will be drawing in air from the outside world into the cameras interior. Normally this is perfectly fine, but if you are operating in rain or a very wet environment such as high humidity, spray, mist, fog etc it will mean a lot of moisture circulating through the camera and this can be a cause of problems. If the camera is warm relative to the ambient temperature then generally humid air will simply pass through the camera (or other electronics) without issue. But if the camera is colder than the airs dewpoint then some of the moisture in the air will condense on the cameras parts and turn into water droplets. A typical dangerous scenario is having the camera in a nice cool air conditioned car or building and then taking the camera out of the car/building to shoot on a warm day. As the warm air hits the slightly colder camera parts moisture will form, both on the outside and the inside of the cameras body. Moisture on the outside of the camera is normally obvious. It also tends to dry off quite quickly, but moisture inside the camera can’t be seen, you have no way of knowing whether it’s there or not. If you only use the camera for a short period the moisture won’t dry out and once the fans shut down the cameras interior is no longer ventilated and the moisture stays trapped inside. Another damaging scenario is a camera that’s been splashed with water, maybe you got caught in an unexpected rain shower. Water will find it’s way into the smallest of holes and gaps through capillary action. A teeny, tiny droplet of water inside the camera will stay there once it gets inside. Get the camera wet a couple of times and that moisture can start to build up and it really doesn’t take a lot to do some serious damage. Many of the components in modern cameras are the size of pin heads. Rain water, sea water etc contain chemicals that can react with the materials used in a cameras construction, especially if electricity is passing through the components or the water and before you know it the camera stops working due to corrosion from water ingress. Storing you delicate electronics inside a nice waterproof flight case such as a Pelicase (or any other similar brand) might seem like a good idea as these cases are waterproof. But a case that won’t let water in also won’t let water and moisture out. Put a camera that is damp inside a wateproof case and it will stay damp. It will never dry out. All that moisture is gong to slowly start eating away at the metals used in a lightweight camera body and some of the delicate electronic components. Over time this gets worse and worse until eventually the camera stops working. Try to avoid getting the camera wet. Always use a rain cover if you are using a camera in the rain, near the sea or in misty, foggy weather. Just because you can’t see water flowing off your camera it doesn’t mean it’s safe. Try to avoid taking a cold camera from inside an air conditioned office or car into a warmer environment. If you need to do this a lot consider putting the camera in a waterproof bag ( a bin bag will do) before taking the camera into the warmer environment. Then allow the camera to warm up in the bag before you start to use it. If driving around in a car from location to location consider using less air conditioning so the car isn’t so cold inside. Don’t store or put away a damp camera. Always, always throughly dry out any camera before putting it away. Consider warming it up and drying it with a hairdryer on a gentle/low heat setting (never let the camera get too hot to handle). Blow warm dry air gently into any vents to ensure the warm air circulates inside to remove any internal moisture. Leave the camera overnight in a warm, dry place with any flaps or covers open to allow it to dry out throughly. If you know you camera is wet then turn it off. Remove the battery and leave it to dry out in a warm place for 24 hours. If it got really wet consider taking it to a dealer or engineer to have it opened up to make sure it’s dry inside before adding any power. If you store your kit in waterproof cases, leave the lids open to allow air to circulate and prevent moisture building up inside the cases. Use Silica Gel sachets inside the cases to absorb any unwanted moisture. If you live or work in a warm humid part of the world it’s tough. When I go storm chasing going from inside the car to outside in the warm to shoot is not healthy for the camera. So at the end of each day take extra care to make sure the camera is dry. Not just any obvious moisture on the outside but dry on the inside. So this normally means warming it up a little (not hot, just warm). Again a hair drier is useful or leave the camera powered up for a couple of hours in an air conditioned room (good quality aircon should mean the air in the room is dry). I keep silica gel sachets in my camera bags to help absorb any surplus moisture. Silica gel sachets should be baked in an oven periodically to dry them out and refresh them. Another symptom of unwanted moisture is a fogged up lens. If the lens is fogged up then there will almost certainly be moisture elsewhere. In the case of a fogged up lens one thing that sometimes helps (other than a hairdryer) is to zoom in and out a lot if it’s a zoom or change the focus a lot. Moving the lens elements backwards and forwards inside the lens helps to circulate air inside the lens and can speed up the time it takes to dry out. Behind the Scenes: Lucy – Shot on the F65. Luc Besson chose the Sony F65 for his scifi movie Lucy. Take a look behind the scenes in this video. While the big news at the moment is the new Venice camera the F65 is still an incredible digital cinema camera with a unique sensor and mechanical shutter arrangement.